Only 67 of these BMW M3 CRTs exist, but does it justify the supercar price tag? $299,950 is a price tag you would expect to see on a brand-new supercar like a Ferrari 488 GTB, Lamborghini Huracan, or McLaren 720S – not a BMW M3 sedan. With such an absurd asking price, this is of course no ordinary BMW M3, which would normally set you back around $65,000 brand new. First introduced in 2011, the BMW M3 CRT (Carbon Racing Technology) was essentially an M3 GTS sedan built using copious amounts of carbon fiber, including carbon fiber reinforced plastic technology which made it 70 kg lighter than the regular E90 M3. Today, CFRP is commonly used on the i3 and i8, but back in 2011 it was a novelty on a BMW since the material was rare and expensive to make. The BMW M3 CRT is also notable for being the last naturally-aspirated M3 ever made, and only 67 units were made in total. Power comes from the same 4.4-liter V8 engine as the Europe-only GTS rated at 450 horsepower and 324 lb-ft of torque. Top speed is limited to 180 mph, while 0-62 mph takes 4.4 seconds. Every M3 CRT was painted in Frozen Polar Silver with Melbourne Red accents. 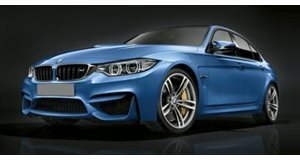 Further distinguishing it from the standard M3 E90 are large 19-inch lightweight wheels, more rigid sub-frames and individually-adjustable dampers. The six-piston front brakes feature calipers made of a special low-weight compound construction, and the M3 CRT also has a bespoke interior with front seats constructed of the same CFRP material. While it was never officially sold in America, this M3 CRT is federalized for show and display use so you can drive it in 49 states, providing you don’t exceed 2,500 miles a year. Avid BMW collectors can find this rare breed of BMW listed for sale on duPont Registry. As the most powerful, rarest and last naturally-aspirated M3, it’s certainly enticing, but we’re not sure if's enough to justify the astronomical asking price.